As he told us in our Ang Lee interview, the filmmaker has certainly tested his cinematic limits by tackling Yann Martel’s global bestseller Life of Pi as his next film. Somehow, by shooting it in 3D, he found a way to film the unfilmable. Like Cast Away before, the bulk of this film involves a man alone in the middle of nowhere, trying to survive. Only this time, instead of Wilson the volleyball, our title character’s stranded companion on a lifeboat is a vicious tiger. 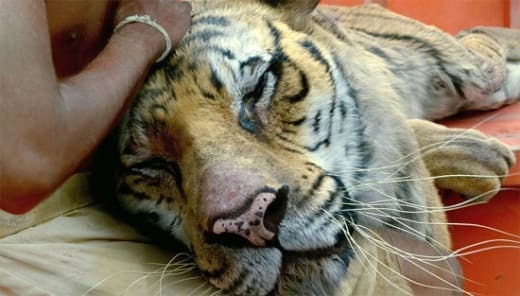 How Pi managed to stay alive with the tiger is the bulk of Lee’s masterpiece. It is not the only storyline, although it's the meat of the story… sorry, didn’t mean to tease that very hungry tiger! Pi grew up in India as a bright young man with a keen interest in his father’s zoo. They live on the property and, as established in one scene, the young Pi takes a liking to a new tiger. A decade later, when the family comes upon hard economic times, they are forced to sell all of their animals. Pi’s family gathers up their zoo animals like Noah and takes to the high seas to sell them to a North American zoo before settling in Canada. An mind-blowing sea storm sinks the ship with its only true survivors being Pi and that tiger he was once fascinated by as a small child. It is there that Lee’s cinematic gifts truly get into hyperdrive. Movie Fanatic believes, that although the filmmaker credits the use of 3D as his muse towards putting together a movie version of Martel’s novel, Lee should not sell himself short. What he achieves with this film, as shown in this Life of Pi featurette, regardless of its dimension, is pure magic. The balancing of story from man recalling his past -- to what we see -- is handled with grace and it's a brilliant way to bring the book to life. The final act imposes many questions that honestly remain unanswered when the credits appear. Some may have difficulty with that ambiguity, but it is nice occasionally to have our movies not wrapped up in a bow. His casting of unknown Suraj Sharma is another stroke of providence worth mentioning. As the film presents in various forms, the question of God and fate rears its head repeatedly. None achieved onscreen is greater than the real life discovery of Sharma to play Pi. Like Tom Hanks in Cast Away, the audience spends much of the film alone with this individual. 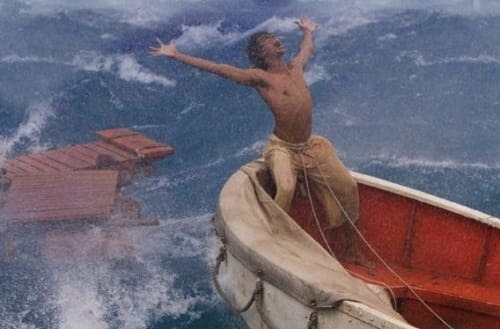 Those who thought lightning in a bottle is what Hanks did in that Robert Zemeckis film, should see Life of Pi to witness how it has struck twice.